Cave Creek, just this side of Paradise. We stayed in Cave Creek, but visited Paradise twice. The whole area seemed a lot like Paradise. Looking toward Cave Creek, on the eastern side of the Chiricahuas in southern Arizona. 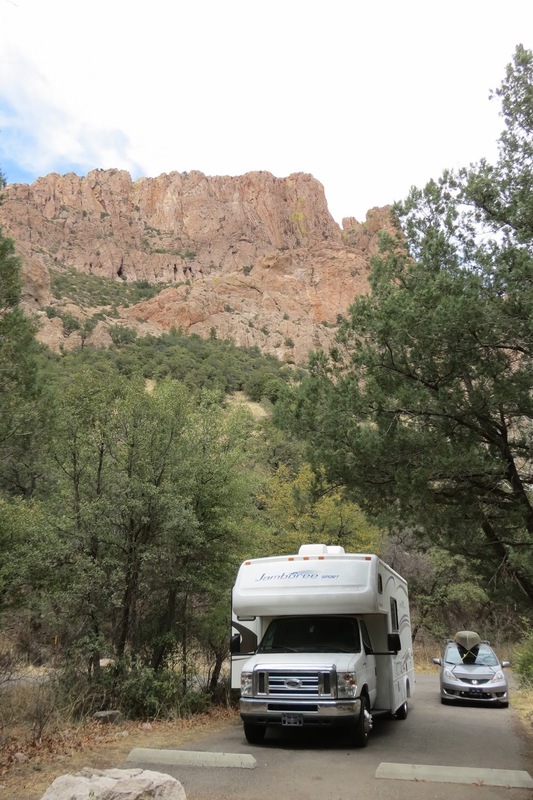 My site at Sunny Flat National Forest campground, surrounded by colorful canyon walls. This is a popular birding area, and I was lucky to get a site the first night. Birdie had to wait until the next day to get into a site big enough for her RV. Entrance to the campground. It stayed full the whole time we were there. As soon as a site became available, it was taken again. Interesting rock formations everywhere you looked. Rabbit ears, or mule ears...take your pick. They turned to gold in evening light. One of Thistle's walks led to this 360 degree vista. The campground is down there somewhere. We saw javalina crossing the road. Part of the bird habitat at the George Walker house. You can see Silver Peak from here. Later Birdie and I hiked about 2/3s of the trail to its summit. The agave feeder holds jars of peanut butter and grape jelly. Donations are accepted to help keep the feeders supplied. Many kinds of Hummingbirds come through here on their migration. There are only about 12 year-round residents in this former bustling mining town, surrounded by National Forest. Almost everyone left when the mines failed. The George Walker house is one of the few original structures left. On one of Thistle's morning walks on a trail leading from the campground, we came across this old explosives bunker, left from the mining days, I presume. Thistle enjoyed his cool morning walks. But the longer hikes not so much. "Just drag me home, Mom, I can't walk another step." Birdie drove us up to Rustler Park, a campground high in the mountains. There is a steep, winding gravel road to get there. But the views were gorgeous. There is still a little snow on that distant peak. The campground at Rustler Park is currently closed due to a recent forest fire (2 years ago, I think). We passed a lot of burned forest on the way. Some areas were spared the devastation. We saw Stellar's Jays up here. A couple of hiking trails have been reopened, with warnings about the burned trees. They are cleaning debris from the burned campground. 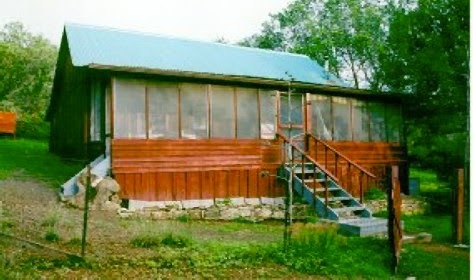 The stone restrooms and metal shelters survived the fire. And the mountains and canyons. Free-range cattle walk up the road and through the campground, looking for fresh grass. On our way back to the campground we stopped at this Research Center where they also have bird feeders out. Thistle checking out Cave Creek behind my campsite. The road to the left follows South Fork. There is a hiking trail there too. The trail followed South Fork. Painted Redstart, a new bird for me. Doing what Rock Wrens do. That night we went owling in the campground. Elf owls had been seen mating the night before. We heard them before we saw them. Elf Owl...not a very good picture. They will be nesting in one of these holes in a Sycamore Tree. Portal is another tiny town near Paradise and Cave Creek. We stopped at the store and then walked through the town, also known as a birding destination. There is just one main road through town. The old gas station...note the gas pump out front. It is now someone's home. Post office and library on the left. Birders are welcome here...every home has feeders out. Spider on the web on this gate...remember the Roths. Thistle stayed home the day we hiked the Silver Peak trail. We knew we wouldn't make it all the way, but decided to go as far as we could. The views were supposed to be great the whole way. We made it to the other side of the Fingers, about 2/3 of the way. The Fingers formation is on the right, Silver Peak is in the center. Birdie coming up the trail. It was mostly a hiking day, but we did see some birds. This is a Townsend's Solitaire. Enjoying the colors of the rock striations. Birdie brought her handheld GPS, and checked it often for elevation gain. We were over 6000 feet when we turned around. The trail skirted around the mountain to the right of the Fingers. Back side of the Fingers. View from the other side of the mountain. Back side of Silver Peak (on the right). We turned around here...after about 3 hours of hiking. Below is the road to Paradise. And a side road to one of the old abandoned mines. An observatory on top of that mountain. This is a popular place for stargazing also...the night sky is very dark. Here we are....going back down the mountain. Do you suppose we could have ridden the horses up there? On our second visit to Paradise, we stopped at the cemetery. I just liked the shape of that tree. We found the grave of George Walker, pioneer who built the George Walker house. Do you remember the Roths from Portal? The web is here, but the spider is gone. Several mine workers are buried here. Some have names, some don't. We didn't stay long at the Walker house this time, as they were recovering from illness. Friends were there feeding the birds and greeting guests. The next day we moved on to Douglas, leaving a lot of trails not hiked in Paradise.